What would be YOUR ideal YOU-cation? Are you a beach, mountain, train, ski/snowboard, or wine in fun places type person? If money was no object, what do you dream about for an ideal vacation? What has been your best You-cation to date? Last week I filled out the paper work and sent my passport into be renewed. It may seem stupid, but it took me a few minutes to let my passport go. I flipped through her pages and smiled at all of her stories. The last ten years of life being told through stamps. I couldn’t help but get teary eyed. This was my second passport completed. I am so thankful for the words and memories she holds in her pages. I would have to say that my passport is my most priced possession. She is one thing that I hold most dear to me. My passport is the diary of my passion and heart. I have traveled to over 14 different countries and used her over 23 times. I have spent time drinking wine in Spain and Italy. I’ve lounged on the beach in the Dominican. I’ve swam with Great White sharks, held tigers, gone on safari, served the poor through faith conversations, and had my life changed by the people of South Africa. I have had life changing conversations and experiences in Lebanon. I floated on the surface of the Dead Sea in Jordan, and watched as scripture came alive on the streets of Israel. I have stories for many more. Life has been full of goodness and exposure. I would trade any of my adventures for anything. I’m excited for what new adventures are to come. I am REALLY excited to check more off of my bucket list!! 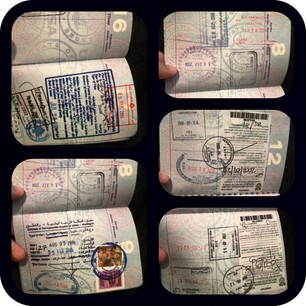 What stamps are in your passport? What tops your list of places to visit and experience? I love traveling. I am a total wanderer at heart. I love new experiences and new places to see. I love basking in the nuances of other cultures and languages. My feet have been on dance floors all over this world. I love having stories that really require the experience to get it. I am so grateful to have seen places where my finger can’t seem to snap the camera fast enough to capture the essence. No matter how much I travel, or even how long the trip duration is, there is something about home. I always smirk when I get to this point of traveling. The excitement of getting away from home was my motivation in the first place! Before every trip, my eyes get wide with the joy of escaping my “normal” routine and doing something new. What is it about comfort zones and known places? Makes me think about the Israelites who were wandering around the desert longing for the place they were just freed from. The Israelites were held captive under brutal slavery by the Egyptians. God heard their groans for help and led a mass exodus to freedom. In the beginning, the Israelites were all about the excitement of something new. They were free! No more beatings from slave masters. No more long days of hard labor. They were free – free from harm, punishment, exhaustion, brutality, oppression, and terror of enslaved life. So why would they long for that again? Somewhere in the desert the Israelites nostalgia of the being freed wore off. Everything in the desert was unknown. Everything required trust and obedience in God who was making himself known. Now they didn’t relocate back to Egypt physically, but in every other way the Israelites created their “knowns” – their Egypt. The Israelites kicked God to the curb and worshipped what they could control. They became enslaved once again. I know home has its comforts, but what about when those comforts are harmful? I read this story and think, “what the heck were they thinking!? How could they want Egypt again! ?” I realized that I do the same thing. God has freed me from so many things in my life. His truth amazes me over and over again. God is matchless in every way, and yet I kick him to the curb. Reverting back to Egypt kept the Israelites enslaved as a nation. I revert back to my own “Egypt” too often. I revert to placing weight on my fears more than truth. I respond out of lies that are on repeat in my heart instead of out of who he says I am. His truths are like signs post on the highway – truth that I let pass by so fast. There are still areas in me that groan in cries for help. Parts of my heart are in need of a second exodus from my own self-imposed shackles. So I am offering up my comforts to him in search of real freedom. I want to experience rubbing my wrists like they do in the movies after the handcuffs come off! MariaGex on Life Story Being Written. NGHoward on Life Story Being Written. Kidaliknibe on Life Story Being Written. StaceyWhell on Life Story Being Written.